This article has not been published in any other format. It was posted on 21 December 2014. It may come as a surprise to learn that there are manuscripts of Andrzej Panufnik’s music still in Poland. The impression given over the years, notably by Panufnik himself, based on information that he received from Polish friends once he had fled to the United Kingdom in July 1954, has been that his music was banned and that his scores removed and destroyed. We now know that this erasure of his name and output was not entirely secure, and one evidence of this is the collection of his working scores and fair copies that is held in the Jagiellonian Library in Kraków. They were deposited between the late 1940s and the mid-1950s. Following my research there last month, I will shortly be examining major scores whose music is known today from later versions. But here I want to address an issue with which some of his admirers feel uncomfortable: Panufnik’s mass songs. If you look on the UK-based Panufnik 100 website, for example, they have been airbrushed out of his list of works. The Polish Music Information Centre website for Panufnik, however, has excerpts from some of the printed scores. It is not my intention here to look at all of Panufnik’s mass songs nor to place his contribution within a genre that includes examples by virtually every Polish composer working in between 1948 and 1954. What I would like to do is to look at his very first examples, music that Panufnik wrote for a competition held to celebrate the imminent formation, in December 1948, of the Polish United Workers’ Party (PZPR). First of all, let me contrast two different versions of events. The earlier one comes from Panufnik’s autobiography, Composing Myself (1987). The later one comes from David Tompkins’s book, Composing the Party Line (2013). Our music was now to be ‘national in form and socialist in content’, ‘depicting socialist reality’ in a way that would be ‘simple and understandable to the broad masses’, ‘deeply ideological’ and ‘worthy of the great Socialist epoch’. It was not long before we received our first directive to put the new theories in action. The [Polish Composers’s] Union was ordered to organise a competition: the composition of a Song for the United Party. Although the Composers’ Union numbered roughly a hundred, we had only one Party member. The lyric we were supposed to set was sheer jargon, and no one wanted anything to do with it; but all of us were ordered to take part. I tried to extricate myself, insisting I was not a good song writer, that the specialists in popular music would produce much better entries. Zosia [Zofia Lissa] refused to let me back out, eventually threatening that, if I failed to produce an entry, our whole Union would lose the financial support of the state. I contemplated the awful title for days in a state of anguish, knowing that I could not let down my fellow composers who, though sharing my political views, felt that I must enter. Then I found what I thought was a cunning solution. I would produce some sort of concoction so that the authorities would note my participation, but it would be so bad that it could not possibly win. I took my piece of manuscript paper and composed a song ‘on my knee’, literally in a few minutes, setting the ridiculous text to the first jumble of notes which came into my head. It was rubbish, and I smiled to myself as I sent it off to the adjudicators. To my great surprise, the jury was chaired by Bolesław Woytowicz, who had always scrupulously avoided any kind of political involvement on the excuse that he had serious heart trouble, so serious that he might not live more than a few weeks, or even days. (He lived for at least thirty years after the competition.) I respected him as a talented composer, excellent pianist and skilled teacher, and thought of him as a good friend – until I heard his verdict. He awarded me the first prize! It could only be a political rather than a musical decision. Leading composer Andrzej Panufnik won the first prize and the large sum of 70,000 złoty for his Song of the United Party. In his English-language autobiography written in the late 1980s, Panufnik tries to explain away his involvement, as he does in so many other areas of his artistic and political life during this period. In this case, he relates that musicologist and party member Zofia Lissa blackmailed him into producing the song, and that she made the unlikely threat that the Composers’ Union would lose state support without his participation. He writes that he cannily plotted to compose a song to show involvement in an unavoidable situation, but with a submission of such substandard quality that he would surely not win. In reality, the circumstances were quite different, and show Panufnik’s eagerness to involve himself – as did many composers in this and other situations – in this competition with highly ideological implications. Culture Ministry officials invited 20 or so composers to take part, but only 15 did so, indicating that participation was not mandatory. Some composers on the original list of invitees did not submit any songs, while others not on the original list, such as celebrated contemporary Grażyna Bacewicz, did take part – a somewhat surprising event, as it has long been thought that she wrote no explicitly politicized works or mass songs. Her song was not one of the finalists, thus indicating that a prestigious name was not a guarantee of success. Strikingly, Panufnik was one of only six composers to write music for each of the three texts, by well-known poets, that the competition organizers suggested. His winning song was Song of the United Party (Pieśń Zjednoczonej Partii) to a text by Leopold Lewin; the other texts were Song of Unity (Pieśń Jedności) with text by Stanisław Wygodzki, and Onward, Working People (Naprzód ludu roboczy) by Leon Pasternak. Panufnik’s choice to compose three songs hardly represents the efforts of someone trying to lose, and is certainly not consistent with the autobiography’s claim that he “composed a song ‘on my knee’, literally in a few minutes.” His winning entry was indeed simple but not uninteresting, and rather typical for the mass songs of the day. Furthermore, Panufnik modified some of the lyrics to accommodate better his compositional scheme, which further demonstrates that he took the project seriously. Alfred Gradstein won second place in a contest that set a template for others to come. • Woytowicz did not take part in the jury for the competition, let alone chair it. In fact, he was one of those originally invited to compose some music, although nothing materialised. 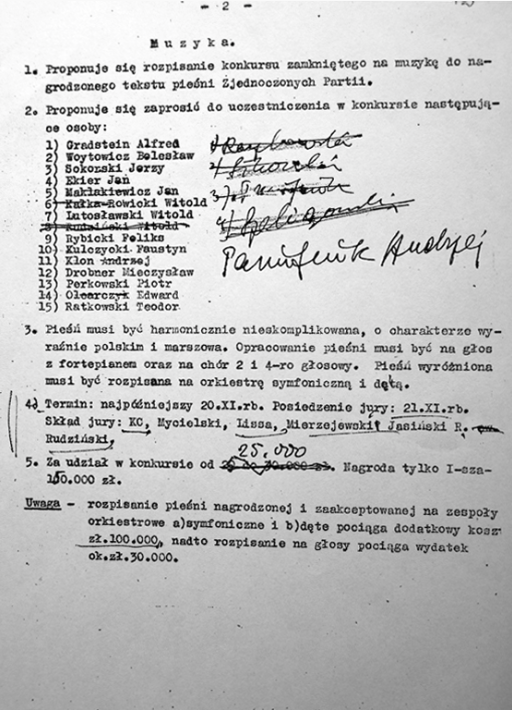 • 5 November 1948: deadline for receipt of texts from poets such as Władysław Broniewski, Konstanty Ildefons Gałczyński, Stanisław Ryszard Dobrowolski, etc.. Participating poets would receive from 10,000 złoty upwards, with one first prize of 150,000 złoty. In the event, the money was split three ways. • 6 November 1948: the three selected texts – by Leopold Lewin, Leon Pasternak and Stanisław Wygodzki – were sent out to composers. • 20 November 1948: deadline for receipt of musical settings. Participating composers would receive from 25,000 złoty upwards, with (again) one first prize of 150,000 złoty. • 21 November 1948: jury meeting to decide the winner. In the end, the first prize was reduced to 70,000 złoty and two second prizes of 40,000 złoty were awarded. All but the three prizewinners was paid for participating (25,000 złoty), which further reduced the differential between winner(s) and losers. The song by Panufnik (Lewin) and one of Gradstein’s two songs (Wygodzki) were sent for publication; the other second prize, awarded to Wiechowicz, was not published. • 1 December 1948: Tadeusz Ochlewski, the Director of the State Publishing House PWM, wrote to the government’s Department of Education and Culture that PWM had printed 34,500 copies of the Songs for the United Party (price: 15 złoty), even though the manuscripts had arrived three days late. ‘As a result, several thousand copies have the original text, later changed’ (Stąd kilka tysięcy egzemplarzy posiada pierwotny tekst – później zmieniony). • 15-21 December 1948: Congress in Warsaw to create the Polish United Workers’ Party. The schedule was evidently extremely tight. It was even tighter for some composers who were not included in the initial list of 15 invitees. The surviving ministerial document is amended and annotated by hand. The numbering 1-15 seems to be completely random. Gradstein, Rudziński and Olearczyk were major contributors to the genre of the mass song. Both Lutosławski and Panufnik both went on to write notable mass songs as well as achieve eminence in concert repertoire. Bacewicz otherwise kept clear of propaganda genres. Some composers were considered significant in their time, such as Perkowski, Szeligowski, Wiechowicz and Woytowicz, but have since faded. Among the other composers, most of them of slight musical significance, are important performers: the pianist Jan Ekier and the conductors Witold Rowicki and Stanisław Wisłocki. In the light of this documentation, Panufnik’s story looks far less special. Tompkins believes that it is in part a fabrication. It may be. The element of coercion looks doubtful. Why would he (or any of the others) be coerced? That Woytowicz, Ekier, Rowicki, Lutosławski and (later) Sikorski failed to produce anything suggests that they felt no obligation. They were, after all, either already eminent or rising stars and could have done with the 150,000 złoty prize as much as anyone else. 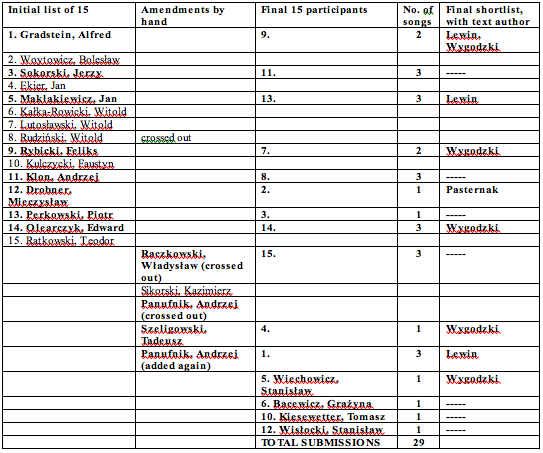 Were the other late entrants (Szeligowski, Wiechowicz, Bacewicz and Kiesewetter) – all major figures – also coerced? If so, as Tompkins implies, why did they not write songs to all three texts like Panufnik, the other major late addition? One aspect of Panufnik’s story is intriguing. Why was he not included in the initial list, which undoubtedly would have been drawn up by the Composers’ Union? Why was his name added, then crossed out, then added again? Is this evidence of his lobbying not to be included? Even if it is, it does not explain why he composed music to all three texts. Nor is the ‘blackmail’ interpretation totally believable. Panufnik used this argument several times in his autobiography to explain his position vis-à-vis the government, but it seems improbable that he was the only one in the Polish Composers’ Union with this sort of sway. His friend Zygmunt Mycielski was President of the Polish Composers’ Union in 1948-49 and was much more influential. Incidentally, Mycielski was down to be on the jury of 21 November, along with Lissa and Rudziński among others, but his signature is missing from the final protokół. Why were Panufnik, Gradstein and Wiechowicz successful? Could they all have been politically chosen? Perhaps the most straightforward answer is that their songs were musically just the best of a bad lot. Of the 29 submitted songs, only Gradstein’s Pieśń jedności and Panufnik’s Pieśń Zjednoczonej Partii seemed to have survived. That is until it was realised that all three of the latter’s songs were in the archives of the Jagiellonian Library. They were deposited there by PWM in 1951. In other words, they were the copies sent by Panufnik for publication and were passed on to the library once they had been issued in print. There are three separate arrangements: SATB (all three songs), two-voice (all three songs) and solo voice with piano (Lewin only). All are in Panufnik’s hand and written in one of his trademark inks: brown. Each of the arrangements has a title page (the illustration above is for the SATB versions) and is initialed and dated at the end: 13.XI.48. This means that Panufnik composed all three songs, in the three indicated arrangements (seven versions in all), within a week of notification and a full week ahead of the deadline of 20 November. (Given the dates and a further change noted below, this surviving fair copy is certainly the one that he submitted for the competition.) The composition was therefore quick, but not hasty. There is one small change at the end of the voice-and-piano version of the Lewin. The date of 13.XI.48 is crossed out in pencil and replaced, again in pencil, with an advisory note to PWM and a new date: 23.XI.48. 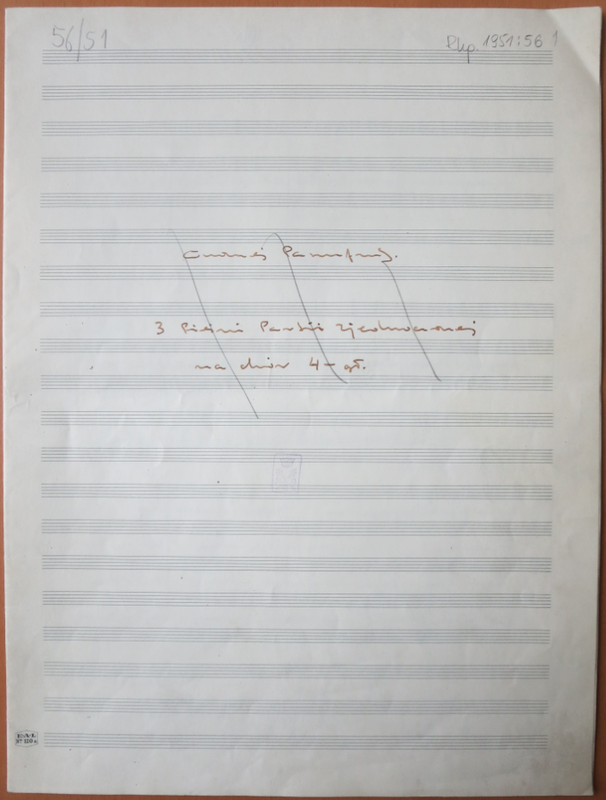 In other words, Panufnik sent the manuscript of this arrangement to the publisher just two days after the jury decided on his song as the winning entry. The other two arrangements, of all three songs, were probably sent at the same time. There are further pencil comments, especially on the SATB arrangement of Pieśń Zjednocznej Partii. These concern two versions of the refrain. 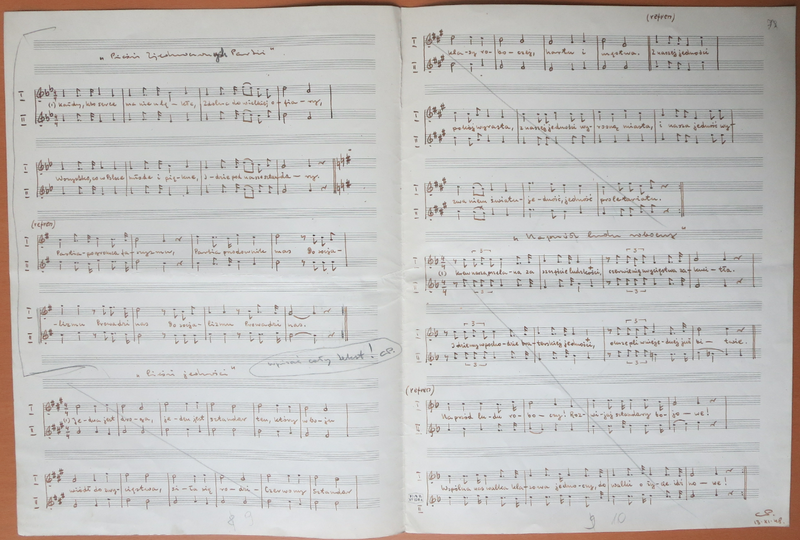 The Wygodzki and Pasternak songs in both SATB and two-voice arrangements are crossed through with single pencil lines – probably Panufnik’s, given the other pencil annotations. They indicate that these two songs were not for publication. What of the music itself? The Lewin song is by far the best, but that is not saying much. The other two are desultory and perfunctory, although the Pasternak song has a mildly interesting idea or two. The two-voice arrangements of the two unsuccessful songs are more persuasive than the SATB ones, especially harmonically. If one returns to Panufnik’s account of these days, one can see that, unproven arm-twisting aside, there is more than a grain of truth in what he says. But his contribution was more immediate, extensive and careful than he remembered, or cared to remember. He was right about one thing: for the most part, this music was rubbish. It might have been wiser to give his mass-song music some thought, as Lutosławski usually did. The irony is that, for all the thousands of copies printed and distributed, Song of the United Party seems not to have fulfilled the propaganda aims of the competition. I can find no evidence of it on the newsreels that greeted the formation of the PZPR during the congress of 15-21 December 1948. You can, however, hear it here. It was also played at the head of a programme broadcast on Polish Radio 2 on Saturday 13 December 2014 – ‘Straightening out Panufnik’s autobiography’ (Odkłamywanie autobiografii Panufnika) – though this seems no longer to be available online.